Every Christmas I try tho think of cute and fun appetizers to serve on Christmas day. Along with a little cheese ball snowman, I like to make this pretty wreath. I love it because it looks impressive, bu t is made in only a matter of minutes with the help of Pillsbury Crescent Dough. 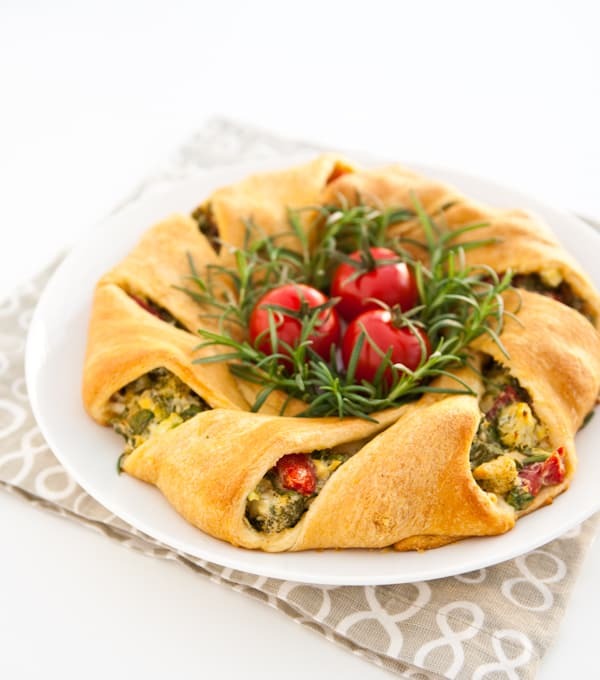 This little wreath is made simply with cream cheese and a few fresh veggies baked in crescent dough. I used a mixture of fresh broccoli, chopped spinach and roasted red peppers in this wreath. If you want to add more flavor, add a few tablespoons each of chopped crumbled bacon and/or green onions. For a quick and easy garnish, I took a few ripe tomatoes from my windowsill along with some rosemary from the herb garden. Heat oven to 375°. 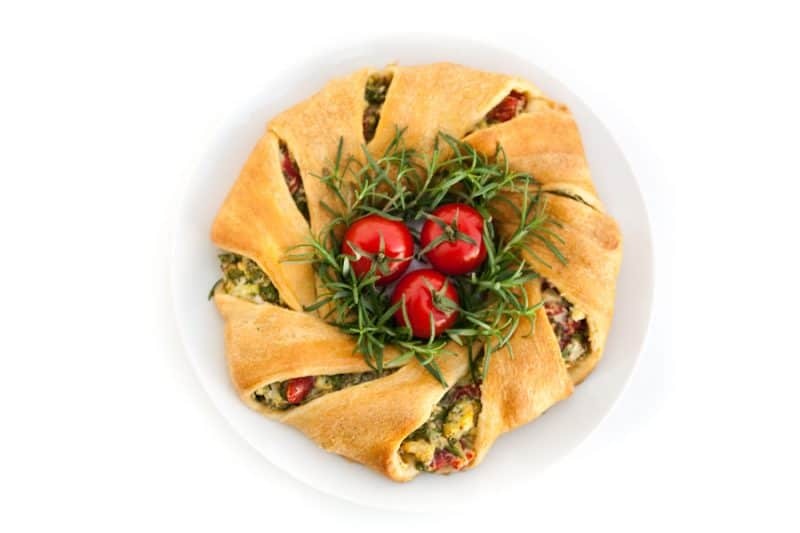 Unroll crescent dough and separate into triangles. 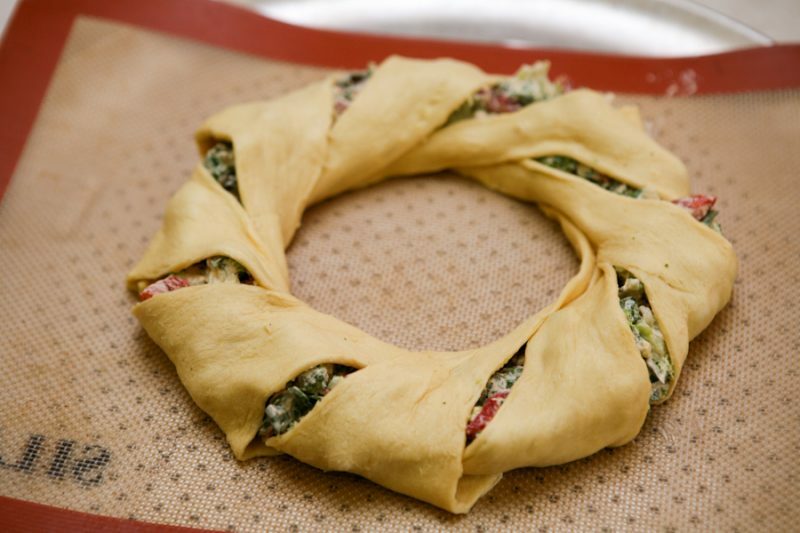 On ungreased cookie sheet, arrange triangles with shortest sides towards center, overlapping in wreath shape and leaving a 4-inch circle open in the center. Combine cream cheese, broccoli, spinach, rosted red peppers, salt and pepper in a small bowl. Spoon mixture on dough. 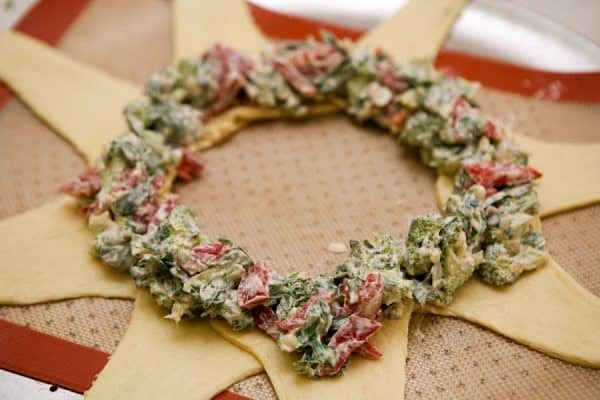 Pull end points of crecent dough and pull diagnoaly over wreath, tucking the ends under to form the wreath. Filling will be visible. Bake for 25 – 30 minutes, or until deep golden brown. Garnish with fresh rosemary and tomatoes. For more flavor, add 2 tablepsoons chopped green onoin. For a bacon twist, add 1/4 cup cooked crisp and crumbled bacon. Fun appetizer! I love the filling ingredients you used. This is a fantastic holiday app! So festive! What a great idea! It is sooooo festive!! How fun and perfect for Christmas entertaining! Love it! Adorable and perfect for holiday entertaining! This looks so delicious and I like the filling! Great idea! It must be delicious. Could You write me what kind of pastry is it? Pastries of this brand are not available in Poland. It is something like for apple pie? The dough is the same you would make crescent rolls with. 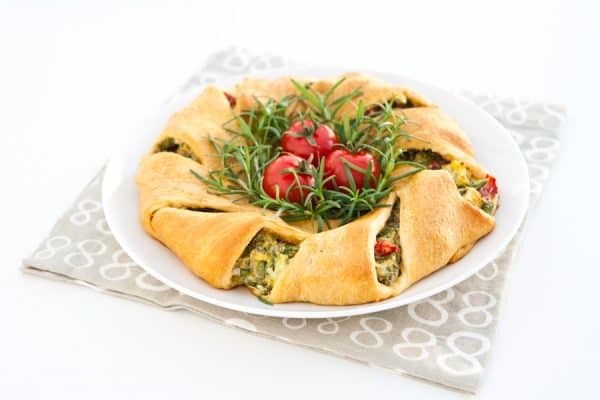 You could substitute homemade crescent roll dough cut in triangles. Delicious, and so pretty for the holidays!! Oh, of course. Angie, thank you for the explanation. It looked to me like a pastry but I don’t know how I could think about it. I always have crescent rolls for the holidays and I am definitely making this! So gorgeous and impressive! I stumbled on this recipe from Pintrest and have made this a handful of times for the holiday season. This is a big hit with friends and family! Everyone loves it! It is so creative and tastes great! Best part, its put together in about 10 minutes! Can’t wait to serve this again next Christmas!